Data is constantly flowing in and out of organizations from electrical and mechanical sensors, RFID tags, smart meters, mobile devices, and other objects. Analysts believe this data will drive a new type of industrial revolution driven by highly accurate, real-time analysis, alerts, and automated decisions and actions. As explored in this paper, the key to capturing the new opportunities afforded by these trends is streaming analytics capable of extracting the meaning from live data as it is created, and automating reactions to it in milliseconds. 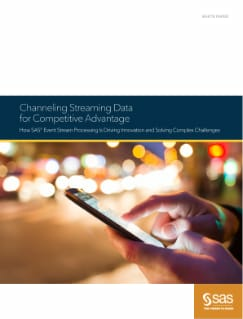 Inside, you’ll read about real SAS customers who are already using streaming analytics to enable revolutionary business models and revitalize productivity and success – and why now is the time to harness streaming data across your business.